A picture is worth a thousand words. This idiom mocks me as I stare down at the white A4 printer paper before me. I am at a loss. Where do I start? I am seated at my first art therapy session with a registered art therapist. She has asked me to doodle about how I am feeling inside the outline of an empty circle. Swimming in self-doubt, I begin to move my pencil. Little do I know that these first tentative strokes will mark my way to discovering the healing power of creativity, and ultimately to a future career as an art therapist. Through my education, research and experience I have come to appreciate how powerful art therapy can be in the treatment of eating disorders. What is art therapy and why is it relevant to eating disorders? 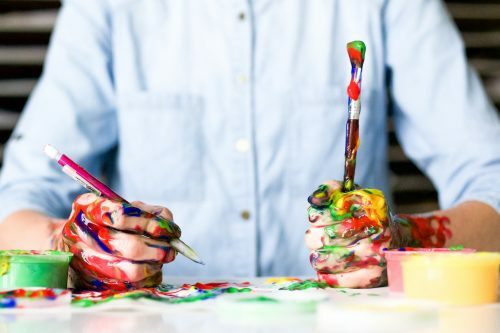 Art therapy combines counselling and psychotherapy with visual arts such as drawing, painting, sculpture, and collage to foster self-expression and self-exploration. A highly trained art therapist carefully selects exercises to guide the therapeutic process, while nurturing creativity, and encouraging discussion and reflection on the art. A self-identified perfectionist, I’ve always felt nervous about creating art. Both my parents were high school art teachers who graded art for a living and spent their free-time creating impressive paintings in a family-room-turned-art-studio in our home. In 9th-grade art class, I would repeatedly erase my half-drawn cover girls, embarrassed that my 14-year-old skills did not live up to their 45 years of experience. I had set an impossible standard for myself – a requirement of perfection that leached into other areas of my life, threatening my ability to feel joy, presence, and self-compassion. Perfectionism is a common struggle in the eating disorder community. For those of us paralyzed by impossible standards, picking up a drawing pencil can be daunting. Controlling the quality of what we exhibit to the world is paramount, and relinquishing control can be uncomfortable if not frightening. Making art is a small but powerful exercise in trusting the unknown and allowing the creative process to work its magic. Contrary to what many of us have been taught, art has no rules, and the mere act of creative expression, not the quality of the art, is what matters in art therapy. If a wonky line or childish stick figure flows from your fingertips, so be it. Art reconnects us with our inner child – that grinning kid with grass-stained knees who played and experimented without fear of assessment. The magic of creativity lies in its inherent surprises. Sometimes when we let go of control what emerges is even more original and astonishing than we could have imagined possible for ourselves. Facing our fear of failure and allowing space for creative play is a meaningful exercise in overcoming perfectionism. While talk therapy is an integral part of the recovery process, there are times when words can be limiting. Words can be used as defenses, keeping unwanted feelings at bay and winding verbal trails away from the sensitive heart of our challenges. Although it feels safe, hiding behind our intellect can deepen the divide between our head and our heart, making it harder to access and communicate difficult feelings. Art can act as an alternative language, helping us express the inexpressible. Those who have never experienced an eating disorder often struggle to understand what it is like to live with the illness. Art can provide a window into our internal world, allowing loved ones to witness and interpret our experiences with more clarity. Feelings of shame surrounding body image and eating habits can be particularly challenging to externalize and express. 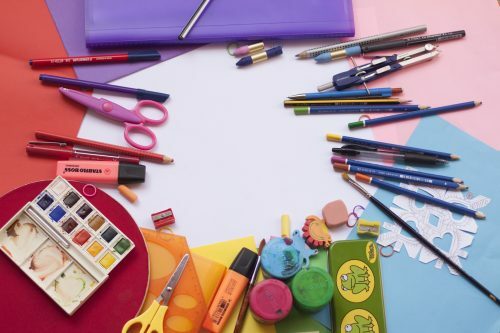 An experienced art therapist can select specific art activities that will help you explore sensitive issues as you feel ready, moderating the art making in a safe, measured and respectful way. Not only does art therapy help us communicate complex emotions, but it also helps us gain insight into our own lived reality. A self-created image offers us an objective perspective on our internal life, revealing aspects of ourselves that we may not otherwise see or acknowledge. It’s a magical mirror reflecting our inner world. The insights that surface can be profoundly empowering. These revelations can shift our thinking, and illuminate new pathways to healing and self-development. Recognizing our innate wisdom, creativity, and self-healing talents builds self-esteem, confidence, and self-compassion. Art can be a powerful coping tool. When external pressures and stressful triggers challenge your progress and entice you to revert to unhealthy habits, art offers an alternative outlet through which to channel your energy and attention constructively. Like a good friend, art is there to converse with you and keep you company until challenging feelings subside. Research has shown that engaging in the creative process can combat stress by activating the parasympathetic nervous system, thereby slowing heart rate, easing anxiety and improving self-regulation. These are only a few ways in which art therapy can support you in your journey to recovery. Interested in reading more about the healing benefits of art therapy? Visit the websites of the BC Art Therapy Association, Canadian Art Therapy Association, and the American Art Therapy Association. When searching for an art therapist in your area look for someone with the letters BCATR, RCAT or ATR behind their name. Any one of these acronyms proves that your prospective therapist is registered with the associations mentioned above and has extensive training and experience. A directory of registered art therapists in your area can be found on these websites. Robin Evan Willis is a graduate student in counselling psychology and art therapy at Adler University. She is also a registed holistic nutritionist, yoga teacher and fitness instructor who is passionate about supporting and encouraging others to live more balanced and joyful lives. 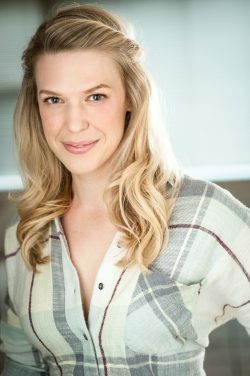 A multi-faceted artist, Robin has worked professionally as an actress, singer and voice actor in Canada and the USA, and is an avid visual artist. Find out more about Robin at www.letsglowhealth.com or on instagram @Letsglowhealth.